Another half marathon done! This is my 11th half marathon since I started running! There are lots of reasons why this year's Las Vegas Rock N Roll Half Marathon was special to me, but the main reason is that this year my running came full circle back to where it all began. The Las Vegas Rock N Roll was my first half marathon ever in 2013. I remember how nervous I was about running this event. Everything was so new to me and I am so grateful to my marathon running cousin, Anel, who traveled from Texas to Vegas to run my first half marathon with me. I will never forget that and how helpful it was to have a pro showing me the ins and outs of race day. My first time running the strip at night, I had all my family and some friends cheering me on from the sidelines. They held signs and gave me high-fives as I ran past them around mile 5. It was such a rush! They were there for me at the finish line and we even got a hotel room for the night so we wouldn't have to deal with traffic leaving the race. We ordered In N Out (fancy! ), did some tequila shots, and celebrated together this accomplishment! Well, as you can imagine by the 11th half marathon and countless other races in between, the fanfare has diminished. Can you blame them? There were no family members giving me high fives along the half marathon course or waiting for me at the finish. But, no matter what, I know I still have their support and encouragement always. 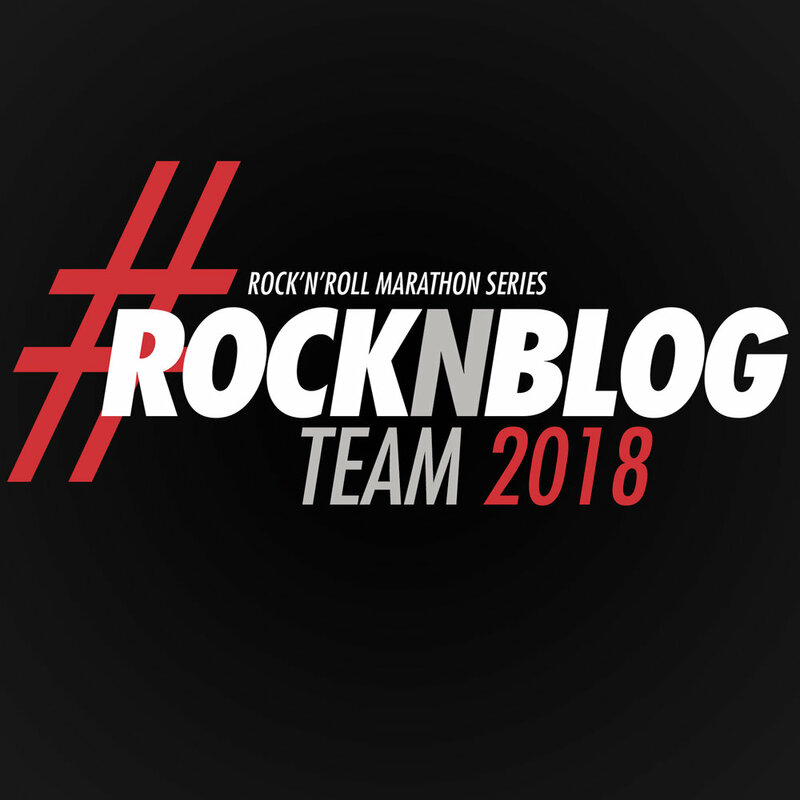 This year, I got to run as part of the Rock 'N' Blog team and I couldn't be prouder to be a part of this running community! I decided to run the Vegas 5K on Saturday and the half marathon on Sunday, as part of the Remix Challenge. You can read more about what's a Remix Challenge HERE, on a post I wrote for Rock N Roll Marathon Series Tempo Blog! For the 5K, my hubby and kiddos came to cheer me on, along with a friend and her 2 daughters who came from California and were also running the half marathon the next day. Parking for the race was pretty easy. The race started at the Las Vegas Festival Grounds across from the SLS Hotel at 6pm. The security was tight, which we were definitely expecting, and they were only allowing the clear Rock N Roll swag bags we got with our registration. I honestly don't remember seeing this posted at all during the registration process or at the expo and of course, my husband had a camera bag they wouldn't let him in with. At least we had enough time and he was able to make it back to the car and drop it off before the race started. Being a Las Vegas local, I wasn't too excited about the course for the 5K, it was an out and back and ran down Industrial Blvd, a side street that is parallel to the strip but nowhere near as glamorous! Although the course was not amazing, the energy and the participants made it fun! There was plenty of lights and music along the course and lots of runners in costume and neon flashing lights on them! After the race and once I met up with my family and friends, I went to get my finisher beer and we sat together for a bit before heading out to our cab loading dinner at Bucca Di Beppo. We didn't stay for the concert. My kiddos have no idea who the Goo Goo Dolls are!!! Sunday morning I had a good brunch and took my time prepping for the race. I met up with my friend, Emily and her friend, Mike, who drove us to the race (no entourage this time!) We parked at Mandalay Bay and took the monorail to the start line area. Although it was crowded and busy, everything was still organized and calm. It was nice to have some friends who were running while we waited for our start time. Bonus: This was the first race where I didn't have to wait in a long line for the port-a-potty! Total Win!! Wasn't this announcement for start times just awesome?!? The race went well for me. I started slow, felt good in the middle, but by mile 10 I lost steam and struggled to keep my pace. The energy from the crowds along the strip was great and I especially loved the lights and music towards the finish line!! There was even an acrobatic performer hanging from a crane and swinging and twirling at the finish line. Only in Vegas! Also, only in Vegas do you get to walk openly with your finisher beer and take photos with Elvis!! These are some pretty fun perks for sure! Of course, getting to run on the strip is pretty epic! But for locals the traffic due to so many street closures can be pretty bad, so getting picked up after the race was kind of a nightmare. I think next time I run this race, I'll play tourist and book a room on the strip like we did for my first one. I'm never one to say no to a staycation! All and all, it was a great time and I'm so happy I got to run this race again! Posted in Race Recaps, Running and tagged with stripatnight, las vegas runner, rock n roll 5k, rock n roll marathon, rock n roll half marathon, Rock N Roll Blogger, rock n blogger, rock n roll remix challenge, rock n roll las vegas, las vegas rock n roll half marathon, las vegas rock n roll 5K, sls las vegas, las vegas half marathon, half marathon runner, half marathon, half marathon recap. November 22, 2017 by Jessie Emeric.